-Pastor Thomas Chantry to Eric Owens, Elder at Miller Valley Baptist Church. Myself and the church I pastor were members of ARBCA for a few years but left that association a few years ago when it became obvious to us that a small clique of power-brokers had taken over the reins. 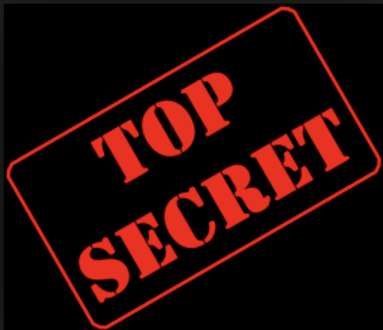 They used a minute doctrinal point to drive many churches and missionaries out of the association but in fact the schism, as we now know, existed in secrecy long before. I confronted these men and received nothing but bullying, denial and “if you don’t like it then get out” response. As stated in your article, the legal system hold that Tom Chantry is innocent until proven guilty. The charges against him are allegations. However, a guilty verdict in a criminal court is not required for the church to determine if a man is “above reproach” as the Apostle Paul instructed as a requirement for the pastoral ministry. I have spoken to people who do in fact know the facts about the Chantry coverup. Yes, there was certainly a coverup by ARBCA although most of us had no idea the situation even existed. Those who served on the investigative committee that looked into the allegations at Miller Valley against Chantry VERY MUCH need to come right out in the public view and tell the world that in fact there was a recommendation for the charges against Chantry to be announced to the entire association. If myself and others are wrong about that, then I ask the members of the investigative committee to say so publicly. But I believe you will find that this recommendation was squashed by some of the very same bullying individuals who still hold power in the association. And so what happened? No one came forward. Chantry went off to another church in Washington state, then off to teach in a Christian school. How is it even possible that a school would hire him if they knew about the charges that had been laid against him back in Arizona? I seriously doubt they even knew. If there were more abuse at the school, everyone who has remained silent shares the guilt in it. Again, if I am wrong and the school really did know about the allegations made against him in Arizona, let them say so publicly and admit their fault. AND THEN the sorry state of affairs continued as, I believe in 2015, Chantry and his church were admitted into ARBCA as members!!! And I also believe you will find that the Miller Valley Church in Arizona protested that action to no avail and resigned from ARBCA themselves. If that is wrong, then please tell us. If it is the truth, then shout it out. Chantry’s home on Woodward St, Waukesha, WI. On Thursday, February 11, 2016, Detective Justin Landry of the Hales Corner Police Department walked up to a nondescript two-story home on Woodward St in Waukesha, Wisconsin, turned on his recorder, and knocked on the door. Pastor Thomas Chantry opened the door and seemed extremely happy to see Detective Landry. Detective Landry advised Chantry that he was there to speak to him about some things that occurred between 1995-2000 in Prescott, Arizona. Chantry’s demeanor instantly changed from that of extremely happy to see Detective Landry to that of a shaken man who looked like he needed to throw up. 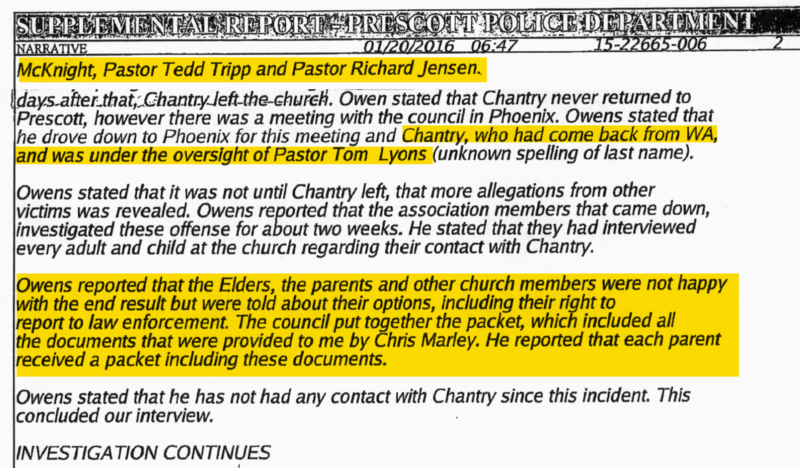 Chantry did not want to speak with Detective Landry about the events that took place in Miller Valley Baptist Church of Prescott, AZ, although he did confirm that he was a Pastor in Prescott during the time frame mentioned by Detective Landry and was now the Pastor of Christ Reformed Baptist Church in Hales Corner. “What else would be happening with the case?” Chantry asked Detective Landry. Detective Landry told him he did not know where the case was going, he was simply asked to interview him. He left his business card with Chantry and told him if he wanted to come into his office to talk about the case he was welcome to do so. 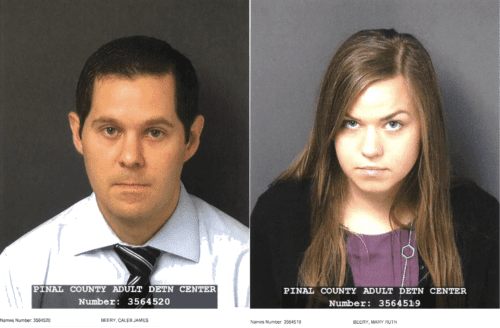 Assisted by fellow pastors and leaders in the Association of Reformed Baptist Churches of America (ARBCA) Chantry’s abuse of children was concealed for fifteen years! Chantry almost managed to recover but in the end his words “I’ve done something I can’t recover from” proved prophetic. Unfortunately, not a single ARBCA affiliated pastor ever broke ranks and informed Law Enforcement of Chantry’s abuse of children. Nor was the love of Christ and compassion for “the least of these” anywhere to be found. Apparently, their fear of a handful of bullies masquerading as pastors outweighed their fear of breaking Arizona law. Any member of the clergy, priest, or Christian Science practitioner who reasonably believes that a minor is or has been the victim of injury, abuse, child abuse, a reportable offense, or neglect shall immediately report or cause a report to be made. A member of the clergy, a Christian Science practitioner, or a priest who has received a confidential communication or a confession in that person’s role as a member of the clergy, a Christian Science practitioner, or a priest in the course of the discipline enjoined by the church to which the member of the clergy, Christian Science practitioner, or priest belongs may withhold reporting of the communication or confession if the member of the clergy, Christian Science practitioner, or priest determines that it is reasonable and necessary within the concepts of the religion. This exemption applies only to the communication or confession and not to the personal observations the member of the clergy, Christian Science practitioner, or priest may otherwise make of the minor. Citation: Rev. Stat. § 13-3620 Any other person who reasonably believes that a minor is a victim of abuse or neglect may report. A person who violates this section requiring the reporting of child abuse or neglect is guilty of a Class 1 misdemeanor, except if the failure to report involves a reportable offense, in which case the person is guilty of a Class 6 felony. What Triggered the Prescott Police Investigation of Thomas Chantry? In 2015 a young man, 18 years old, attended a summer camp. At this camp, an educational film was shown on sexual abuse. In viewing this film the young man became angry and upset. He had been sexually molested by Chantry in 2000 and had never dealt with the situation and realized he needed to. The young man is now a member of Cornerstone church in Prescott, AZ. 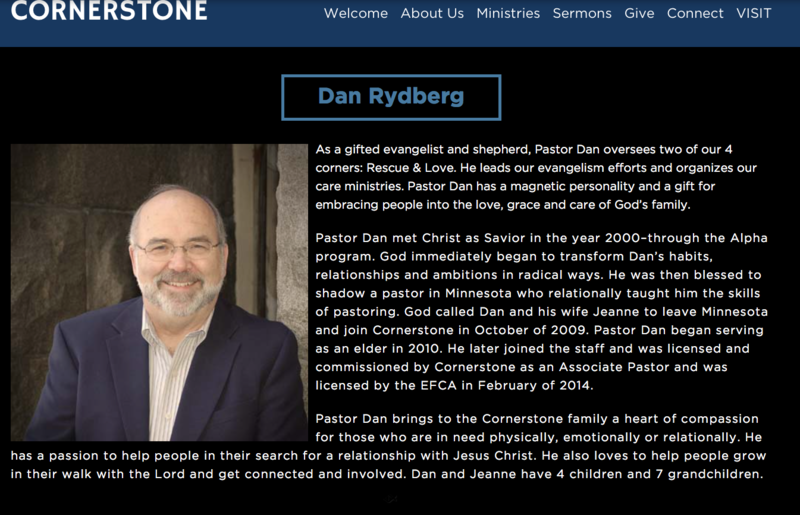 He is a shy individual but trusted Dan Rydberg, an associate pastor at Cornerstone, and bravely recounted his story of abuse at the hands of Tom Chantry to Pastor Rydberg. Pastor Dan Rydberg, a humble, compassionate, and loving man, instantly knew that Law Enforcement must be notified. He convinced the young man that this was the right thing to do and it was agreed that Pastor Rydberg would first call the Prescott Police and inform them of the alleged crime, and then the young man would talk to police. Pastor Rydberg is one of the heroes in this sordid story of physical and sexual abuse. In a case where many adults, including pastors, elders and parents knew of the abuse for fifteen to twenty years and did nothing, Pastor Rydberg immediately did the right thing. 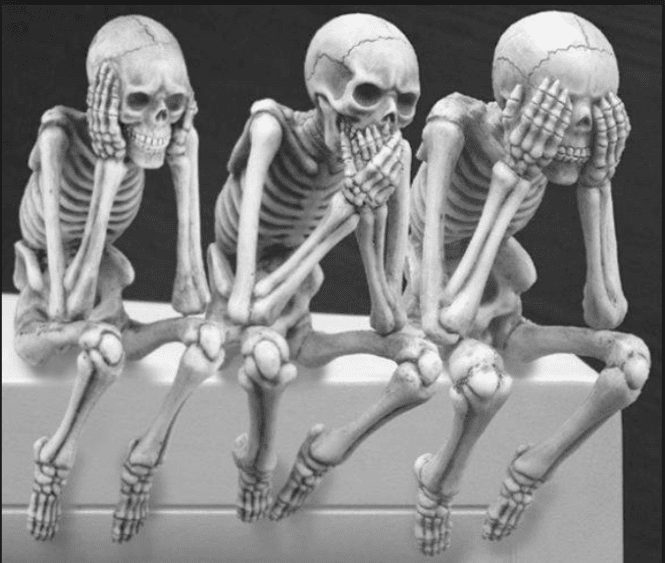 Leaders of the ARBCA remained silent! It took an outsider, a pastor of an Evangelical Free Church, to inform the police. I tip my hat to Pastor Rydberg. Unfortunately, he retired in April 2016. Cornerstone Church has lost a good man. Prescott Police, being in receipt of credible information that the sexual molestation of children allegedly occurred while Tom Chantry was the pastor at Miller Valley Baptist Church, opened an investigation into the matter. It would make sense that detectives would first go to Miller Valley and interview individuals that may have knowledge of the case. This appears to be what happened. Police reports back up what Marley told me. Above we see the first mention of the three men who were on the investigative committee assigned by the ARBCA to conduct an investigation into the behavior of Tom Chantry. This three-member panel consisted of Mike McKnight, Pastor Tedd Tripp, and Pastor Richard Jensen. Mike McKnight was an elder at Grace Baptist Church of Carlisle, PA. The pastor of Grace Baptist was Walter Chantry, father of Tom Chantry. Walter Chantry was reportedly very upset with McKnight because of the report of the investigative committee. 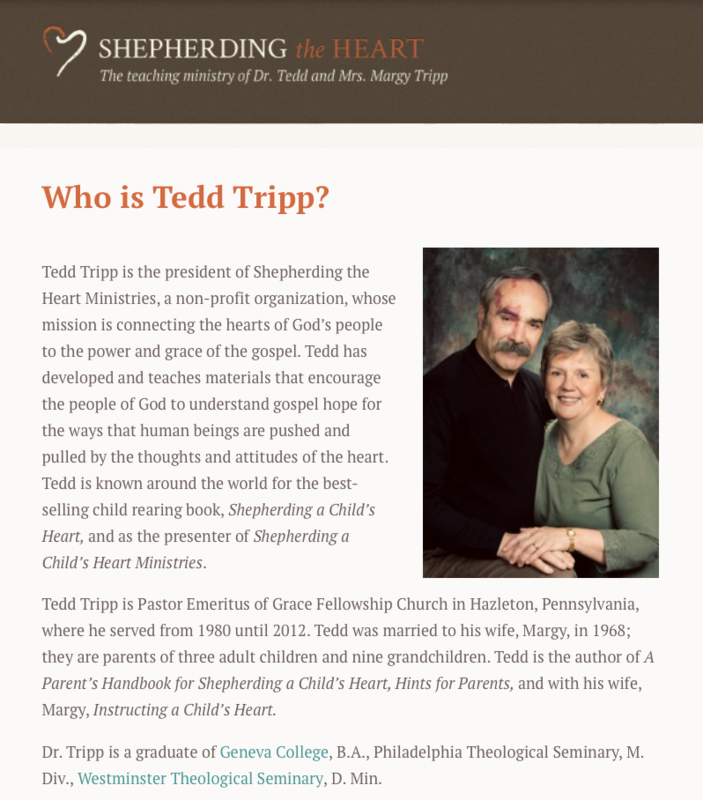 Pastor Tedd Tripp was the pastor of the Grace Fellowship Church in Hazelton, PA. Tripp and his brother Paul David Tripp have authored several books and are well known in evangelical circles, holding frequent seminars. Pastor Richard Jensen is the pastor of Hope Reformed Baptist Church in Long Island, NY. 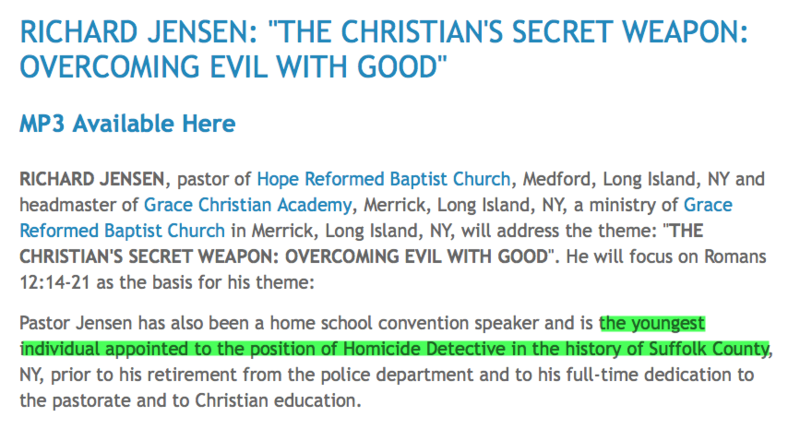 Prior to serving as a pastor, Jensen was a homicide detective! By all accounts, this investigative committee did a thorough job. They were at Miller Valley Baptist Church for two weeks* and interviewed every adult and child at the church. “I realize that this puts him (Tedd Tripp) and many other men for whom I have a deep and abiding respect, into a very suspicious light. I have never spoken to Tedd directly about his actions and I am certain that the committee of three men were sworn to some sort of secrecy regarding the matter. 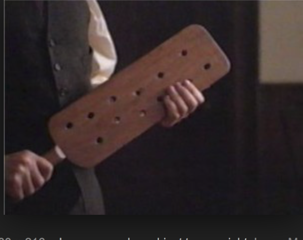 Who are the Bullies in ARBCA That Have Worked To Suppress the Reports of Tom Chantry’s Abuse? What follows I will readily admit is speculation, but this speculation is based on my personal experience while conducting research and the input of sources knowledgeable of the men in power in the ARBCA. I have given a partial list of names, it’s really left up to the many good people affiliated with the ARBCA to, as Jeff Crippen stated, do some housecleaning. Back in early December when I was researching the Tom Chantry story I had deduced that when Chantry fled Miller Valley Baptist Church of Prescott, Arizona, he ended up attending Providence Reformed Baptist Church in University Place, WA. On December 7, 2016, I placed a call to the church and Pastor Tom Lyon answered. I explained who I was and informed him that I was conducting research for an upcoming article on Tom Chantry. I asked him if Chantry had been a pastor at Providence around the years 2000-2001. Lyon said, “Yes he was.” I then asked him if he had time for a few more questions. Lyon responded that he was on another line and asked if I could call back in four or five hours. I explained I was calling from Dubai and asked if I could email him. He responded that email would be fine. Your statement: "You have already confirmed for me that Chantry pastored Providence Reformed Baptist Church." is incorrect. I confirmed no such thing. Maybe Pastor Lyon misspoke to me when he told me Chantry was a pastor at his church. It is reasonable to expect Lyon knew why Chantry had fled his church in Prescott. It would be unreasonable to think that a Pastor with this information would then allow Chantry to work in any capacity in his church. But then it would also seem unreasonable that Lyon would preach at Chantry’s wedding and again at his installation. It would also be unreasonable to think that Lyon didn’t inform Christian Liberty Academy of Arlington Heights, IL, the school where Chantry taught for four years after leaving Providence Reformed Baptist Church, of Chantry’s past. But it seems Lyon is an old friend of the family. Perhaps loyalty to friends trumps character? Tom Chantry, standing left, dining with Larry Vincent to his left and parents Joie and Walter to his right. “Walter Chantry was born in 1938 in Norristown, Pennsylvania. He was raised in the Presbyterian Church and was converted to Christ as a teenager. He graduated from Dickinson College in 1960 with a B.A. in History, and went on to receive a B.D. from Westminster Theological Seminary in 1963. That same year he was called to be pastor of Grace Baptist Church in Carlisle, Pennsylvania where he served the Lord for the next 39 years. 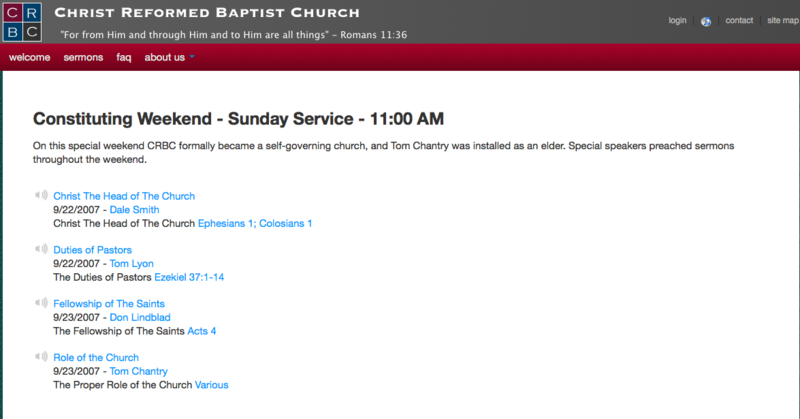 Tom Chantry’s church, Christ Reformed Baptist Church, was accepted for membership in the ARBCA in 2016. According to the ARBCA constitution, the new member church must be recommended by one church who is already a member. 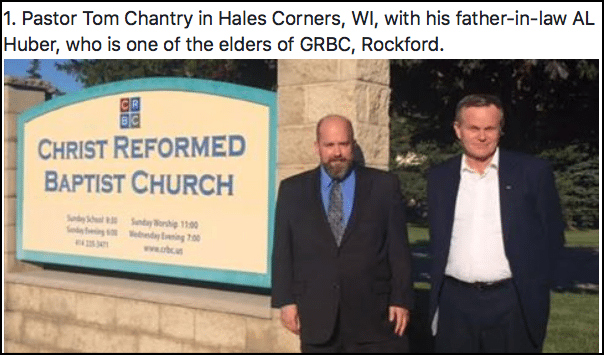 I would guess the church who recommended CRBC was Grace Reformed Baptist Church of Rockford, IL. This is the church where Al Huber, father-in-law of Tom Chantry serves as a pastor. Dale Smith is the other pastor. (Link) Both are influential men in the ARBCA. It is hard to imagine that they were unaware of Chantry’s sordid past. I am uncertain if either of them were on the Administrative Council at the time of the investigation, but surely they must have known of the report. If they indeed were the church to recommend Chantry’s church for membership in the ARBCA you have to wonder about their integrity. Also, an alarming thing to consider is if Al Huber knew of Chantry’s past, how could he possibly allow his daughter to marry him? (Editor’s note – 12-2017) I have received a reasonable request from a reader asking me to clarify that the photo of the Administrative Council above is a photo of the Administrative Council in 2016. The makeup of the Administrative Council in 2000, the year the Administrative Council decided not to release the investigative report of Thomas Chantry’s actions, did not consist of all the same men who were on the Administrative Council in 2016. Specifically Michael Kelly was not a member of the Administrative Council in 2000. Not that it has bearing on the accuracy of the facts documented in the article, but in the pic captioned above, “Tom Chantry, standing left, dining with Tom Lyon to his left and parents Joie and Walter to his right.” Tom Lyon is actually not pictured. While I do not know the identity of the man sitting to the left of Chantry, it is not Tom Lyon. I have to disagree with you on this one. Pretty sure I would recognize old “Lying” Tom Lyon. Has the trial started? If so, what was the outcome or is it ongoing? Hi, thanks for the comment. Todd and I have done extensive research into the question you asked. It looks like the trial has been delayed several times. However, Chantry’s lawyer seems to have asked (from my perspective as a non-lawyer just doing research) that the records regarding Tom Chantry’s legal situation be removed from public databases. Therefore, it’s hard to know that the status of the case is. The best way to get information would be physically going to the court house, which appears to be handling Chantry’s case. If anyone is interested in doing that, feel free to contact me on the contact page. I’ll share the research I have regarding the relevant courthouse and the relevant records pertaining to Tom Chantry’s case. Thank you for this detailed report on the government’s case against Tom Chantry. If the report by the investigative team of McKnight, Tripp and Jensen was truthful, the members of the ARBCA Administrative Committee who chose to cover up the evidence appear to lack a fear of God. Jesus warned in Matthew 18:6: “But whoso shall offend one of these little ones which believe in me, it were better for him that a millstone were hanged about his neck, and that he were drowned in the depth of the sea.” Woe to Tom Chantry if he has committed these crimes and goes into court to swear that he did not. Jesus said “For nothing is secret that will not be revealed, nor anything hidden that will not be known and come to light.” Luke 8:16 I am praying for the truth to be uncovered and justice upheld. You are welcome. 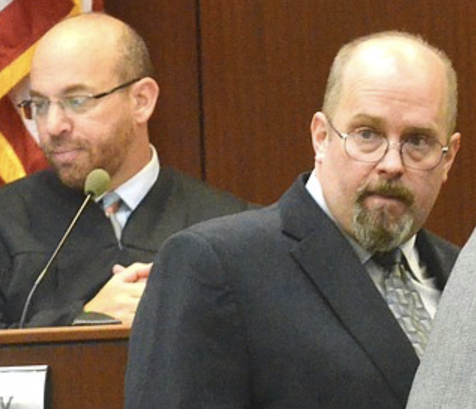 The trial, after several delays, is scheduled to take place in April. I will be watching closely. This website is a very clearly distorted, biased, slanderous, attempt to paint Tom Chantry as an evildoer before any just determination is made as to guilt or INNOCENCE. This site & some others continue to insult & call Chantry names with no legal basis for it. Likewise against those who refuse to rush to judgment. The fact that my post has been removed 6 times is a testament to their unwillingness to hear more than their side of the issue. Art, I would think that a financial advisor would have better critical thinking skills than you display. You disappoint me. I think your friendship with the Chantry family is blinding you to the obvious facts of the case. I suggest you start your own blog where you can write in great detail about the innocence of Tom Chantry and how the ARBCA Administrative Council has been completely honest and not covered up the abusive behavior of Chantry. I deal with facts, not rants on this blog, therefore I will not be approving any more comments by you unless they contain documented, factual evidence. I’ve always been skeptical of Rome-like hierarchies, aka ‘church associations.’ There are many that believe in the misconception that a church plant must be “sent out” by one of these Assoc’s (and/or their churches). Whether they be on the Arminian, side or the Calvinist side, wrong is wrong. Christians must always remain impartial advocates of the truth, no matter how it hurts. I totally agree with you Chaplain Bill. Thanks for the comment. I am sort of struck on what seems to be Tom Chantry’s lack of control with the initial abuse. There is a sadistic side to it along with the perversion. The fact he was allowed to just leave town with no report made by the church leaders, speaks volumes. I agree that his dad was most likely the reason. In my early days of researching Calvinism/Reformed, quite a few mentioned Walter Chantry’s name with reverence and awe. I had never heard of him before but he was revered in Reformed circles. I do know that much. I’m sad, angry, disgusted and disheartened at this sordid story and am especially sad at the failure of a man like Tedd Tripp to report this predator to authorities. I’ve benefited from his ministry over the years but nothing could be further from shepherding a child’s heart than to bow to the pressure of men and fail to report this to police, thus exposing more children to having their heart crushed by a predator wolf in sheep’s clothing masquerading as a minister of the Gospel. I tweeted to Dr. Trip asking him how this could be true but I suspect that I won’t get an answer and I’m fully expecting to be blocked so I’ve saved a screen shot of my tweet. I would encourage others who read this to pressure him as well and demand an answer and demand repentance. Thanks, Todd, for presenting this thorough overview. You’ve spotlighted ARBCA leaders and systems, facts and timelines in ways that I believe give a careful and reasoned case for cover-up of known/suspected child abuse. May all the survivors and their families and friends find comfort and recovery in Christ, and may full truth and justice emerge in this situation. Thanks for the compliment Brad. Thanks also for your help. You saw that I used your reference to AZ statutes! Todd, you have done a very thorough job of bringing to light the evidence. And like Brad, I want to honour the victims who have bravely come forward and reported what was done to them. May each and every one of you be blessed and healed by the Wonderful Counselor Jesus Christ — who Tom Chantry and his allies have so horribly misrepresented to you, but failing to protect you when you were children. 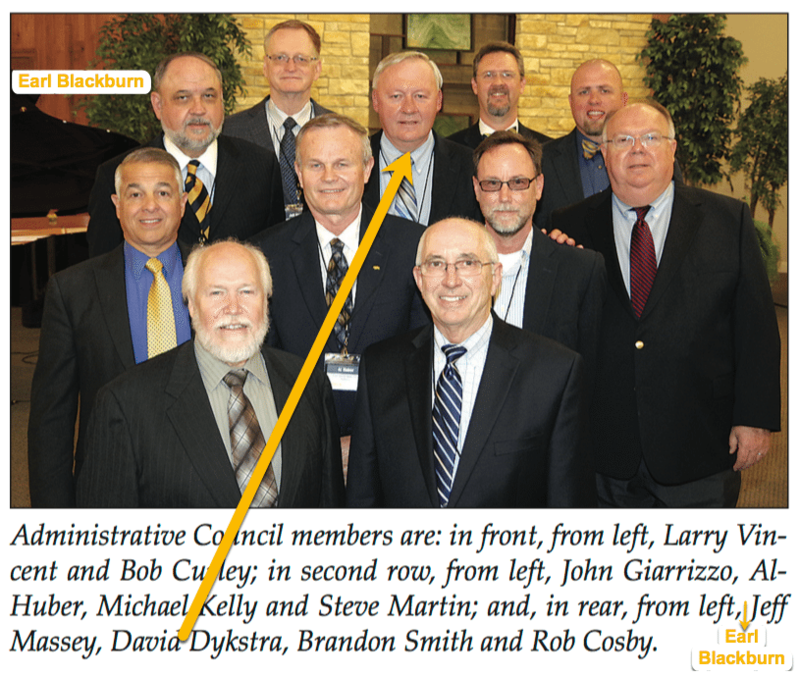 Hey Buddy!, I found this information for you: "Association of Reformed Baptist Churches of America (ARBCA) Leaders Coverup Chantry Abuse". 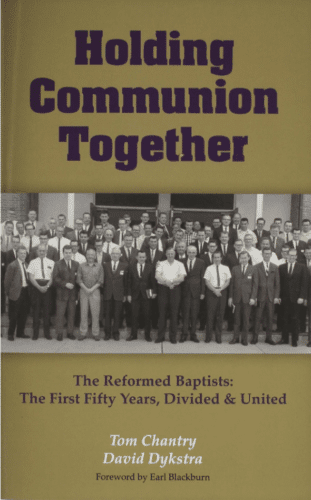 Here is the website link: https://thouarttheman.org/2017/01/27/association-reformed-baptist-churches-america-arbca-leaders-coverup-chantry-abuse/. Thank you.